You will see how your dominant thoughts, emotions and actions create the circumstances of your life. And when you change your dominant thoughts and emotions, and start taking the right actions, your environment will reflect those changes and your circumstances can improve dramatically. If you want to change your circumstances, you must first make a change within yourself. As Mahatma Gandhi once said, “Be the change that you wish to see in the world”. Albert Einstein once said that the definition of insanity was “Doing the same thing over and over again and expecting different results “. You can achieve anything you want — Providing you set clear goals, and follow a specific formula that will bring them to fruition, you can achieve anything. Your beliefs have power — What you believe completely determines whether you can achieve your goals. Fortunately, you can change your beliefs! A crisis could be your best opportunity — Facing and overcoming setbacks gives you the power and resources to achieve any goal. They act like a springboard to success. You can’t be rich if you have low self-worth — Your self-worth determines your earning potential. Improve it and your finances can improve dramatically. The magic is within you — You already possess everything within you that you need to become highly successful. You can achieve your goals by using this powerful system. Goals determine your future — The lives of people who set goals can turn out very differently to those who do not set goals. Without goals, your life can drift — You can end up just reacting to changing circumstances, becoming disempowered and disillusioned with life. Goals allow you to live a better life – By setting goals, you can discover what you are truly capable of, and have a much bigger impact on others. Goals help you to overcome your limitations — Goals allow you to create forward momentum in your life. They also enable you to create the life that you want. Goals empower you – They can enable you to become more capable, empowered, happy, successful, and fulfilled. Absolutely anything that has been causing you to suffer, especially if it’s been going on for a long time, can be converted into its opposite to create a powerful new goal.Write out each of your goals and add the words “so that” after each one. Next, fill in your reason after the words “so that”, and this will bring you even deeper. Keep on going deeper by adding more “so thats” until you discover your single motivating reason for your goal. Knowing exactly what you want is important – When you know what you want, you are far much more likely to achieve it. You have been conditioned – Your disappointments and setbacks have conditioned you to expect a mediocre life. What you expect then limits what you can achieve. Discovering what you want is easy – Write out a list of all the dissatisfactions and frustrations in your life. Converting these into their opposites can create powerful goals. Wants and needs – You may want something because it enables you to avoid something you don’t wish to face, whereas a need is something that can truly improve your life. Your Big Why – By using the Big Why technique, you can drill down to discover the single underlying motivation behind each of your goals. To become clear about what you want, simply write out a list of all the things you would like to achieve during your lifetime. It doesn’t matter what order you write them in — what’s important is that you write down as many goals as you can possibly think of. It’s okay to cross goals off your list later if you find that they’re not particularly important to you, or if you don’t feel emotionally connected to them. Also, remember to create goals for each major area of your life so that nothing important is left out. It’s important to know exactly what you want – To become very clear about what you want to achieve, you need to know what you want. Goal brainstorming sessions – Write out all the goals you want to achieve during your life. If necessary, do several sessions over a week or more. Create goals for each major area of your life – Including your finances, career, relationships, recreation, health, and personal growth. “you are what you think, believe, and feel”. Your mind affects your environment — Your thoughts and beliefs affect your actions and achievements. However, they may also affect your environment itself! Energy cannot be destroyed — Emotional energy can influence your environment and other people. It can be used as a powerful catalyst for change. Your mind influences physical matter — Thoughts and emotions can affect scientific experiments, and influence the outcome of those experiments. Do your own experiments — Prove to yourself that your mind affects your environment, and discover the power to create anything you want. 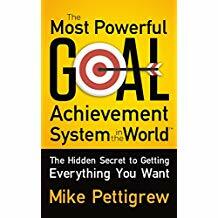 combine several goals that are closely related into a single, new condensed goal – a goal that contains a powerful motivating factor (PMF). Condense your list of goals – Group them into goals of a similar nature, or goals that can support each other. Identify goals that have a powerful motivating factor (PMF) – Make sure that each condensed goal includes one. Create your goal anchor (GA) – Use it every day to inject strong emotional energy into your goals. This can greatly speed up the achievement of all your goals. Your subconscious mind — It makes up 95% of your mind, and it has a huge influence on all your successes and failures in life. You have been conditioned — You have been conditioned all of your life, and right now your conditioning is most likely sabotaging your goals. You can overcome conditioning — You can influence your subconscious mind and overcome your conditioning using powerful mind programming techniques. Regroup your condensed goals – Regroup them into short-term, medium-term, and long-term goals. Include a deadline for each goal – This is so your subconscious mind has the specifics that it needs to bring you what you want. You are responsible for your beliefs — Your thoughts, words, and actions determine your beliefs. By changing your beliefs, you can change your experiences. Language of the subconscious — Your subconscious mind is influenced by repetition and strong emotion. You can use these to change your internal programming. The power of affirmations — Affirmations are a simple, effective way to program your mind, so you can achieve your goals more quickly. Benefits of hypnosis – This is a simple, safe, and effective way used by scores of highly successful people to overcome their conditioning and achieve their goals more quickly. Subliminal technologies – This is an effective way to influence your subconscious mind, so you can program it more efficiently, using subliminal voices and images. Biofeedback – This is a simple way to relax your body and mind so deeply that you reach the hypnotic state easily, so you can reprogram your subconscious mind for success. Brainwave technologies – There are powerful new ways to bring yourself into a deeply relaxed, focussed state where you can embed new programs into your mind. Creative visualisation — This is a highly effective way to embed positive, empowering images into your mind of what it will be like when you have achieved your goals. Convert your goals into affirmations – Convert each of your short-term, medium-term, and long-term goals into an affirmation. Repeat each affirmation morning and evening – Read them aloud while triggering your GA, and visualise what you will experience as though you had already achieved it. Create a vision board or a mind movie – This can make even more positive impressions on your subconscious mind. Use mind programming technologies – For example, try light and sound machines, subliminal software, biofeedback, and hypnosis to complement and enhance the effects of your affirmations. Develop a positive mental attitude – It’s the key to happiness, and will bring all sorts of wonderful opportunities to you. Improve your self-image – It is responsible for all your successes and failures in life. Improve it and you can achieve your goals a lot more easily. You can control your mind – It’s the only real control you have in your life. Therefore, when you control your mind, you can control your life. You can be deeply happy – Happiness is a choice. When you treasure yourself, and develop a more caring attitude, you also deepen your own happiness. You have the power to change – By becoming solution-focused, you can overcome any problem and change any situation more easily. Create your action plans — Action steps help you to move towards each of your goals. Use mind mapping to stimulate creativity and see your path more clearly. Use focusing questions and the 80/20 rule – This will ensure that you always take the most effective, efficient actions that you can possibly think of. Add more actions steps – As they become obvious to you, add more action steps. Take action every day – Take daily actions so you make consistent progress towards your goals and see the results of all your efforts. In the early part of the twentieth century, Edgar Cayce summed up the components for maintaining a healthy life in the acronym C.A.R.E. C: Circulation…we can only become healthy when our circulatory system is functioning correctly. Therefore, we must get sufficient exercise each day. A: Assimilation…. Assimilation is the body’s ability to digest and distribute food efficiently. R: Relaxation…. Relaxation includes not only getting enough sleep, but also setting aside time for recreation. E: Elimination…Unless our body is successfully getting rid of the waste and toxins that build up in it, we can experience all sorts of long-term and chronic problems. Increasing your brain power — The food you eat, the water you drink, and the exercise you do directly influence your brain and what you can achieve. Healthy body – healthy mind — To achieve your goals more easily, you need to improve these areas: circulation, assimilation, relaxation, and elimination. Food intolerances — It’s possible that you have food allergies that could be slowing you down. Get tested and know for sure! Nutritional supplements — Due to modern farming techniques, your food may be lacking in nutritious value. Supplementation can help give your body what it needs. Exercise and sleep — For your body and mind to work effectively, you need to get adequate exercise and get between seven and nine hours sleep each night. the world’s most successful people, you will discover that they use daily routines and habits that consistently move them towards success. People who focus on achieving peak performance aim to win once, but often find that they cannot sustain this peak performance state for very long. High performance is not about working harder or faster. Nor is it about becoming a multitasking machine. High performance techniques allow you to consistently achieve great results in each area of your life, while reducing your stress, increasing your feelings of well-being, and enhancing your health and vitality. Planning daily activities is one of the simplest and most effective secrets of high performers. Highly effective, successful people create new habits such as blocking out time, and they use these to consistently achieve sustained levels of high performance.When you block out time to work on your goals, you also need to minimise distractions as far as you possibly can. High performers are expert time managers and have no problem in ruthlessly eliminating activities that do not progress their life goals – their goals for their wealth, family, health, and happiness. daily success planner. This will help you to create your own daily routine, and it will assist you in blocking out your time for important activities. the research shows that multitasking makes a person more stressed and a lot less productive – by as much as a staggering 40%. High performance studies have found rather than multitasking, taking short breaks is better for your performance. Each break only needs to be as little as 2 or 3 minutes long, and you need to take it every hour (or at least every 90 minutes). When you experience challenges that stretch your life, it’s almost like you qualify yourself, and show you are worthy of achieving that goal.It will give you the motivation and determination you need to keep moving forwards, so that you can overcome the setback. Step 2: Write out 10 benefits you could experience by overcoming this challenge. Step 3: Write out 10 actions you could take that might help you overcome this challenge. Step 4: Write out 5 inner qualities you could develop by facing and overcoming this obstacle. In almost every case, highly successful people refuse to give up. What separates those who achieve very little progress in their lives and those who change the world comes down to one thing — and that is persistence. Step 3: Next, speak the same sentence aloud again “I can’t become rich because…….” and quickly write out another reason why you can’t become rich. Step 4: Now look at each of your reasons, and you may be surprised by what they reveal! As you may remember from the earlier section on affirmations, you need to write them in the present tense. They also need to be positive, personal, and specific. You can then create opposite beliefs and convert those beliefs into affirmations that cancel out your limiting beliefs and their effects on your life. You have been conditioned — Other people and what you have experienced have conditioned you. Your circumstances never define who you are or what you can become. Your beliefs are powerful — They determine what you experience. Your subconscious beliefs hold you back — They also constantly sabotage your success. You can change your beliefs — By doing so, your circumstance will also change. Uncover your limiting beliefs — Do this using the “because” technique. Overcome those limiting beliefs — By creating opposite beliefs and converting them into affirmations that program your mind for success, you can overcome limiting beliefs. There is just one guarantee in life, and that is that nothing ever remains the same. Everything in the universe is in a constant state of flux. if we are to survive the coming robotics revolution, remain employed, become successful, and achieve our life’s biggest goals, then we must learn new skills — and quickly. True benefit comes when we learn a new skill and immediately put that learning into practice. We cannot truly say we have learned something unless we have actually put it into practice — understanding only comes after we take action. Knowledge only becomes power when it is acted upon and used. Lifelong education is vitally important — Robotics and artificial intelligence is changing the world. You must learn new skills and become more capable from now on. Success can be learned — There is no need to reinvent the wheel. Seek out excellent teachers and you can succeed at anything you want. Transform your life — Mentors and coaches will help you overcome your current limitations, learn new skills, and achieve your goals more quickly. Coaching for success — A good coach is the greatest gift you can ever give yourself. Coaching is one of the fastest and easiest ways to ensure you achieve your goals. Mastermind groups — A group of people with a common purpose is powerful. You can brainstorm, learn new skills, keep yourself accountable, and always moving forwards. We are here in this world to grow spiritually, and help others in any way that we can. carry out your major life purpose (MLP) Every human being is simply too complex to be limited to only one single activity. Passion + Daily Action = MLP When you are passionate about certain things in your life, and you take consistent actions in those areas, then you start living your life with far greater purpose. you need to start living today as though each day were your last day. Purpose — Living with a sense of deep purpose is a source of joy and fulfilment. It allows you to achieve what once seemed impossible. Your purpose is your source of power. A common purpose — According to research into the evidence for life after death, we all share a common purpose: to grow and also help others to do the same. Your own unique purpose — You also have a unique purpose that can energise you. You can find this when you explore your passions, life experience, and talents. Your time is valuable — It’s actually the most valuable thing you possess, and gives you unlimited potential to achieve anything you want. Never waste time! Get answers to any problem – Use the powerful exercise to get answers to any problem, directly from your subconscious mind. Use the creativity muscle boosting technique – Use this simple technique to ensure you always have a stream of great new ideas for achieving your goals. Ideas notebook – Write down all your new ideas in a special notebook, and keep it close to you at all times.